At first it sounded like someone was trying to start an outboard motor. Or, seeing we were in the middle of a forest, maybe it was a dirt bike. Or was it a chainsaw? It started with a deep, rumbling growl that rose steadily in volume and menace before descending into a series of guttural grunts. Then I clicked: It had to be a wild pig. We were about to charged by a heavily tusked, hiker-hating boar. But why was the sound coming from a tree? Eventually my guide pointed out what appeared to be a grey, furry basketball lodged high in the fork of a gum tree. An amorous koala on the lookout for love. It turned out the mystery sound was in fact the mating call of an amorous koala. They might look cute and cuddly but when these randy marsupials are looking for love they sound anything but. That first call from a lovelorn male koala was soon followed by another. And another. In fact, their mating calls were so frequent they became the soundtrack to my two-day taster of the Great Ocean Walk. My guide said she’d never heard so many koala calls. Maybe it was the return of cool, dry weather after heavy rain that had awakened their libidos, she said. 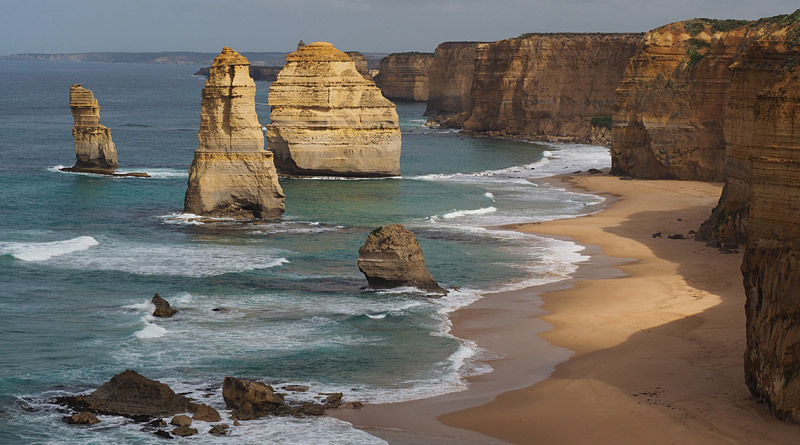 The Great Ocean Walk starts at Port Apollo on the Victorian coast, about three hours’ drive west of Melbourne where the famed Great Ocean Road veers inland to avoid the Otway Range, and ends 100km later at the 12 Apostles, an iconic series of rocks stacks carved by the sea. It has been improved and extended since it first opened in 2006 and there are plans to extend it another 12km west to Port Campbell. Officially the walk takes eight days but it can easily be done in six. 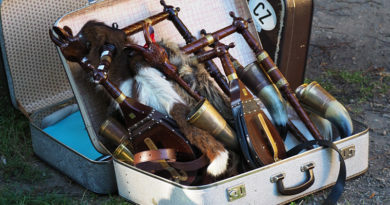 I could spare only two days but my guide, Marie Killeen, reckoned she had picked the two best bits for me. And she should know — she’s walked the trail end-to-end more than 50 times. Marie is the senior guide at Auswalk, a company offering walking holidays around the Lucky Country. It’s a very different experience from tramping in New Zealand. Each morning a driver drops you at the starting point with a map, instructions and packed lunch, then picks you up in the afternoon further down the trail to ferry you to that night’s lodgings. Guide Marie Killeen takes a breather on the top of Bald Hill with Three Creeks Beach in the distance. The beauty of it is that you only have to carry a small daypack, plus you get to eat magnificently and sleep in comfortable beds. It’s ideal for people who enjoy the great outdoors but don’t like camping or lugging a heavy pack. It works well in Australia because many of their long-distance trails have road access at regular intervals, unlike multi-day tramps in New Zealand. Auswalk lets you choose between self-guided walks or fully-guided trips with a group and two guides. In my case, due to time constraints, I had a guide all to myself. Marie and I started at Marengo, a few kilometres beyond the official start at Apollo Bay. I arrived in the middle of what was supposedly Melbourne’s worst downpour in 80 years. It rained all the way to Marengo where, almost miraculously, the clouds parted and the sun burst through. I didn’t have to unpack my raincoat again. For the first half day we were never out of sight of the Southern Ocean as the track led over headlands, across beaches and along clifftops. At Elliot Stream the trail swung inland — that’s where we heard our first lovesick koala — and through pretty much every type of bush you’ll find on the Victorian coast. 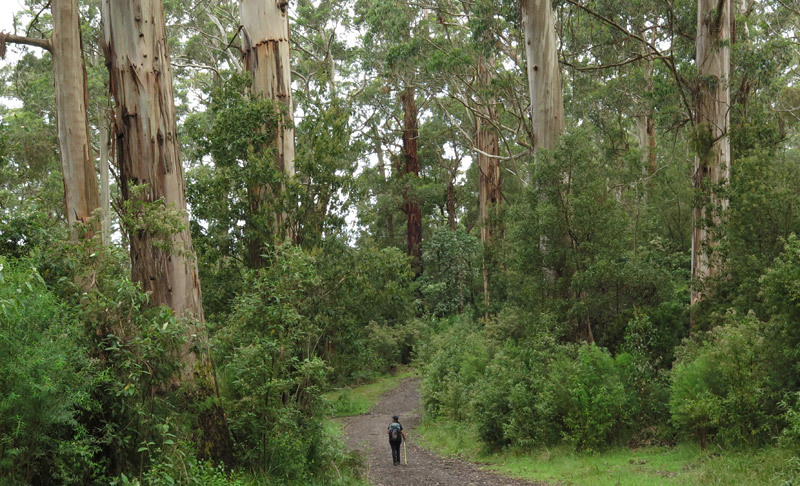 There were aptly named stringybarks, lush gullies dominated by treeferns, manuka-like thickets of paperbark, and forests of towering mountain ash which Marie, a walking botanical encyclopedia, told me is the world’s tallest flowering hardwood. Our first day’s walk ended at Blanket Bay where our ride was waiting. In 20km we’d seen just two other walkers. “That’s the beauty thing about this track. You don’t see a lot of people,” Marie said. We stayed at Aire Valley Guesthouse, a historic farmhouse converted into a B&B and run by the ebullient Susie McDonald, an outstanding cook, winemaker, Francophile, art lover and Chinese medicine practitioner. Susie gave us a tour of the delightfully idiosyncratic property — not every Aussie dog gets to live in a Hobbit house — and cooked us a fabulous dinner of freshly caught snapper with roast veges. Later, because it was uncharacteristically chilly, she threw several tonnes of wood on the open fire. Our second day started at Milanesia Beach, a wild and deserted stretch of sand, before climbing a series of stairs to Bowker Pt and a cliff-hugging track offering superb views of rugged headlands battered by the sea. After lunch we hit a stretch of trail Marie affectionately called the Roller Coaster, a strenuous few hours of up and down rewarded by a gently undulating track through shady eucalypt forest, emerging at a viewpoint called The Gables. There were fewer koalas on day two but we did see wallabies, soaring wedge-tailed eagles and a blue-tongued lizard chilling out on the track. But no catalogue of Australian wildlife would be complete without mentioning the flies. These are not the meek, timid creatures we call flies in New Zealand. You can almost hear them laugh as you try in vain to brush them off. I now understand where the Aussie salute — the constant, almost subconscious, one-handed wave in front of the face — comes from. 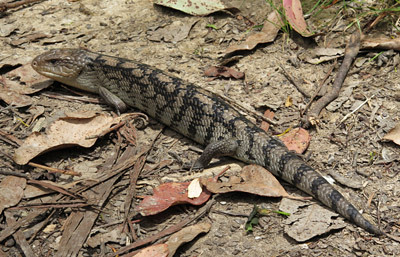 A blue-tongued lizard chills out on the track. 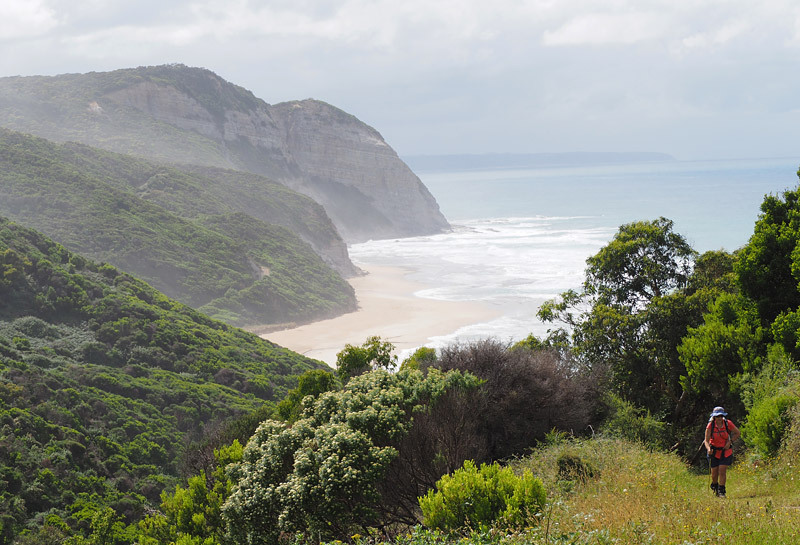 It’s not hard to see why the Great Ocean Walk is one of Auswalk’s most popular trips. And why Marie doesn’t get bored despite traversing it end-to-end more than 50 times. That’s 5000km or, with those little legs, about seven million footsteps. “I see it in different weather and different seasons, and seeing it through the eyes of my customers is really lovely. Also, it’s the surprise of the wildlife — the koalas peering down on you, the swamp wallabies, the echidnas, the occasional snake,” she said. For her customers the walk’s appeal was the sheer variety of habitats and environments. Marie and I had only walked about a third of the trail but there was no way I was going to miss the scenic highlight, even if we had to drive. The Great Ocean Walk ends at the 12 Apostles, a dramatic series of rocks stacks carved by the sea. The brittle rock is constantly eroding and changing, which explains why only about eight Apostles remain. I had grand plans to get up early and see the Apostles at first light. That way I’d also beat the crowds which can hit 12,000 a day in peak season. But when the dawn sky was grey and uninviting I lingered in bed instead, breakfasted leisurely on Susie’s home-made muesli and arrived at the coast mid-morning — just as the sun broke through a bank of cloud and cast a golden light on the Apostles rising from a dark and crashing sea. Spectacular. For more information about Victoria’s national parks and the Great Ocean Walk go to parkweb.vic.gov.au. You can also download a free app for your phone called ‘Great Ocean Walk Audio Stories’. Go to auswalk.com.au to find out about hiking trips organised by Auswalk, either in a group or self-guided, or visit www.airevalleyguesthouse.com.au for more about Aire Valley Guuesthouse. For general tourism information about Victoria check out www.visitvictoria.com. Unlike other parts of Australia there are no national park entry fees in Victoria, but there is a small fee if you use the seven campsites along the Great Ocean Walk. The walk is supposed to be done from east to west. Great article and great photos Peter. It was my and Auswalks pleasure to show you my backyard. I’ve been down that way a few times but didn’t know about Auswalks. Thanks Peter! Thanks Kerry! It was great catching up with you in Melbourne. Watch out for those randy koalas.